South Africa team manager Roger Bunton earns the award for the first UCI Juniors Track World Championship team official to arrive at Stadium Southland Velodrome. A regular visitor to New Zealand and Invercargill, Bunton is overseeing the South African junior programme and brings a squad of six riders to contest the 2012 Junior Championship. The riders and remaining support team arrive at 10am tomorrow (Tuesday). 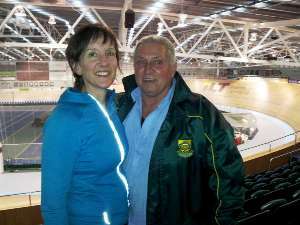 Pictured left: South African team manager Roger Bunton with Junior Worlds Event Director Sue Clarke at Stadium Southland Velodrome.